Milwaukee has had a Coast Guard station since 1867, and is currently located on Lake Michigan on the south side of town. 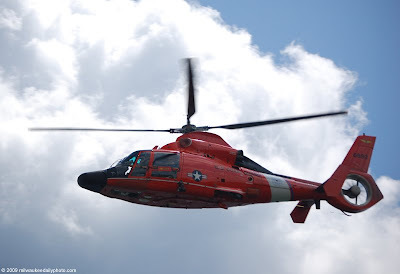 Many days, you can see this Coast Guard helicopter patrolling the shore, its bright orange paint job (and relatively low flight path) easy to pick out. 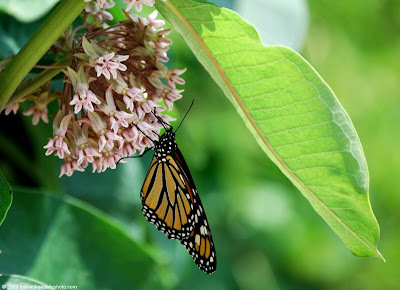 While out shooting the other day, this Monarch butterfly would not leave me alone. That was what I thought, anyway. Until I realized that I was between the butterfly and its intended destination. These fragrant blossoms certainly smelled good, and I'm thinking they must have had some sort of nectar as well, as there was a bumblebee perusing them soon after the butterfly left. Today's photo is another from Sunday's air show. 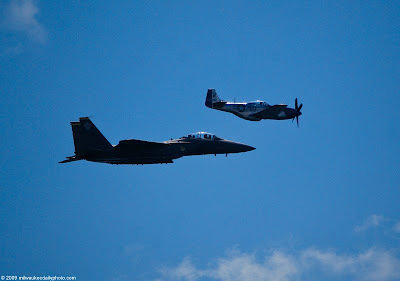 After the F-15 was done with its demonstration, it was joined in formation by a vintage P-51 fighter. The two of them flew together for a few minutes and performed a few maneuvers. The contrast in technology and ability made for an interesting sight. 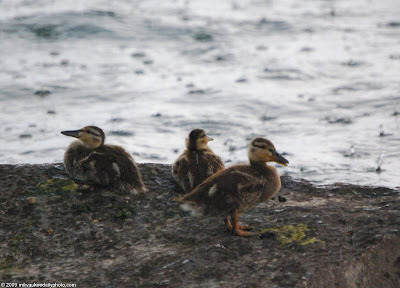 Sitting on a rock just off the water's edge, these ducklings were enjoying their nap in the sun when surprised by a sudden, heavy shower. As I was sitting under a tree, they proceeded to hop into the lake, swim to shore, and find a dry spot themselves. I thought ducks liked water? Today was the second and final day of the 2009 Milwaukee Air and Water Show. 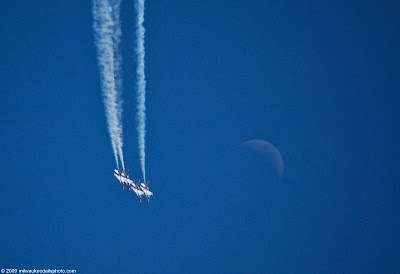 The headline act of the weekend was the Air Force Demonstration Squadron, commonly known as the Thunderbirds. They put on quite a great show, and I took a LOT of photos. The moon made a surprise appearance in today's photo, and I was shocked to see it there when I looked at the shot on my camera. 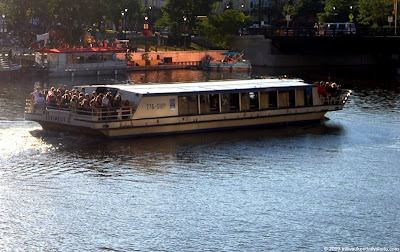 This boat is the Edelweiss II, one of two large boats operated by the Milwaukee River Cruise Line. The Line offers a number of public cruises with food and drink included, as well as charters for those looking for a more private experience. 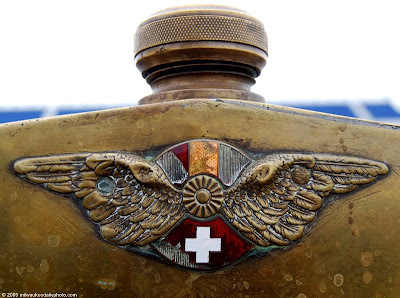 Combining the Spanish and Swiss national flags with a pair of wings, this hood ornament appeared on a Hispano-Suiza automobile at the Miller Meet a couple weeks ago. I loved the detail in the wings, and the obvious aging of the ornament. Given that this car was built in the first third of the twentieth century, it must have some interesting stories to tell. 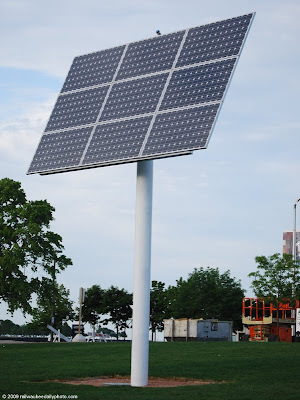 Down at Discovery World, there's a lonely solar panel out front collecting the sun's rays and converting them to electricity. While a neat idea in its own right, it seems to be kind of small considering the amount of energy the exhibits must require. Tonight, I went down to Alterra on the lakefront with some friends for a coffee after dinner. 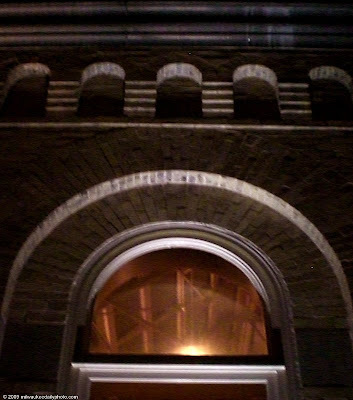 The pumphouse building is a great reuse of the space, and it was a great evening to spend some time outside enjoying our drinks and conversation. 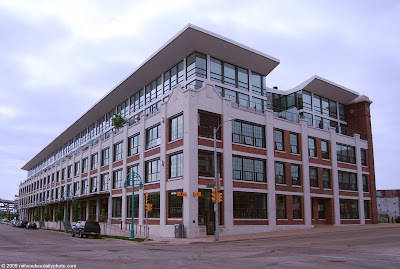 This building on the corner of Erie and Young Streets is a former warehouse that has been converted into a combination of commercial space and condominiums. The large windows look great from the outside and must offer some superb views of the river and the rest of the area. Festivals, fairs, and warm summer days... we've had a lot of the first two, and we're looking forward to more of the third. 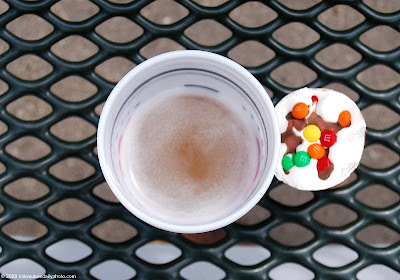 I usually don't enjoy ice cream with my beer, or the other way around for that matter - but this was an opportunity too good to pass up. We planted some purple cone flowers in our backyard this year as part of our remodeling project, as well as to bring some color into the yard. 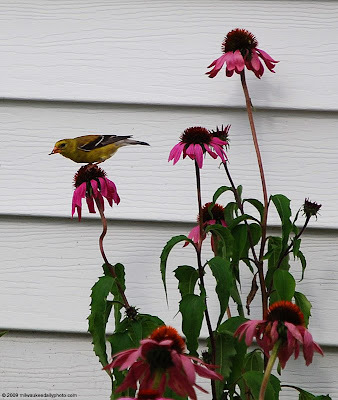 One unintended consequence was that these flowers attract the goldfinches in the area. They seem to love to feed on the blossoms, eating the seeds that the flower produces. 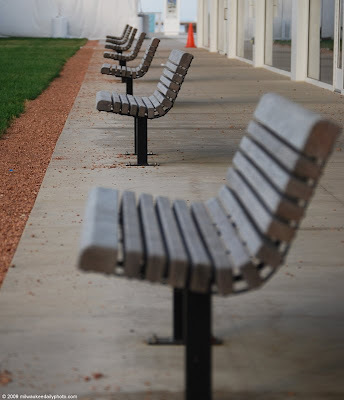 These benches sit adjacent to the Discovery World Museum, and look towards the Milwaukee Art Museum. Discovery World is trying out a summer movie series called "Fish Fry and a Flick" on Friday evenings. Next Friday's feature is Animal House. Leave the kids at home, and head on down to the lakefront to catch a movie! 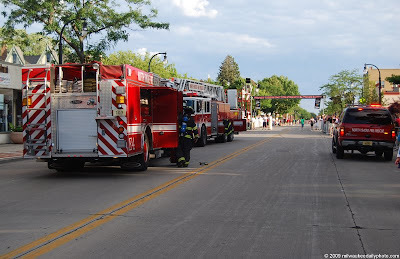 Last evening, the Shorewood Criterium had to be stopped early in the race. After asking a nearby police officer what was going on, we were told that the fire trucks were on the course, responding to an emergency call. I hiked over to Oakland Avenue to see what was up, and saw this scene: a number of fire trucks and other rescue vehicles, and the firemen were opening the windows of a second-floor apartment and putting fans in the windows. Apparently, someone had burned dinner badly enough to warrant a call to 911. Eventually the smoke was cleared, the trucks sent back to their stations, and the race was restarted. 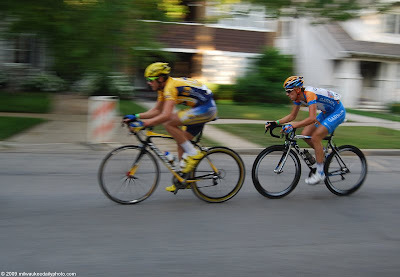 Riding down city streets and through residential neighborhoods, the Shorewood Criterium was this evening. As part of the Superweek Professional Cycling Tour, the event featured some of the top riders in the world. Former participants include a number of riders currently riding in the Tour de France, including Lance Armstrong, Levi Leipheimer, and Cadel Evans. The Super Premium in tonight's race was awarded to the rider leading with 4 laps left, and was $1664. The tour will be in Schlitz Park downtown this coming Saturday... stop over and watch if you can! A bagpipe, a didgeridoo, keyboard and drums. 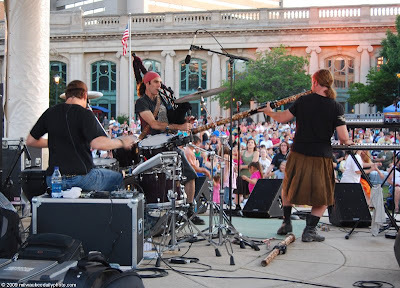 Wednesday evening, Brother played Pere Marquette Park as part of the River Rhythms series. Their unique brand of celtic tribal music made for a large crowd and lots of dancing. It was a perfect evening to be outside enjoying the band and the company of friends. One more photo from the circus parade. 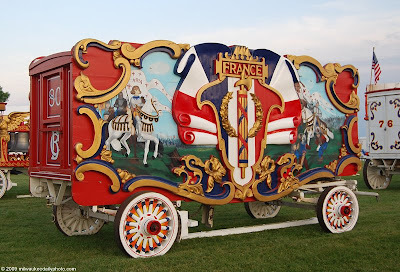 This picture is of the France wagon, and depicts scenes from French history on the panels. Happy Bastille Day to our friends in France! 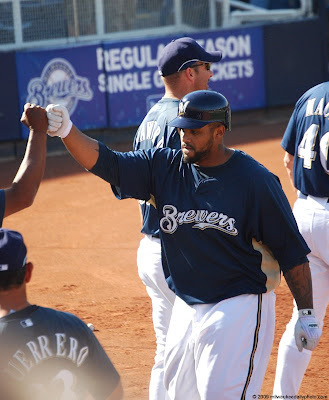 Congratulations to Prince Fielder of the Brewers for winning the Home Run Derby at the competition preceding tomorrow's All-Star Game in St. Louis. I got this photo of him when we went to Spring Training back in March. Here's to hoping the National League can break the American League's streak and get a win tomorrow night! This year's Bastille Days featured a large mural depicting scenes from French history and locations. 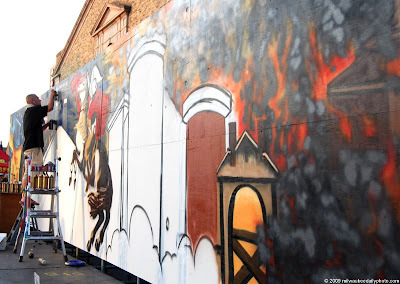 The artist pictured in today's photo is Eliot Patterson of Resicomm Graffix, painting with spray cans. The ability of these artists to express detail with spray paint has always fascinated me. A special note: This is post number 366 for Milwaukee Daily Photo, marking the end of the first year and the start of the second! When I started this a year ago, I wasn't sure how it would go. Thanks to all of you for your kind comments and positive feedback over the last 12 months. I'm looking forward to bringing you more from Milwaukee (and sometimes, points elsewhere) in the future! Part of the circus parade festival down at the lakefront includes the animals that are part of the show. 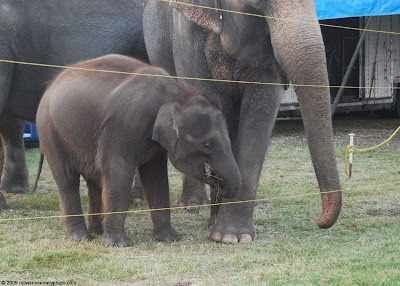 The elephants included this baby, and it was stealing the show from its older cast mates by walking around and 'shouting'. The volume alone was impressive, and certainly got our attention. 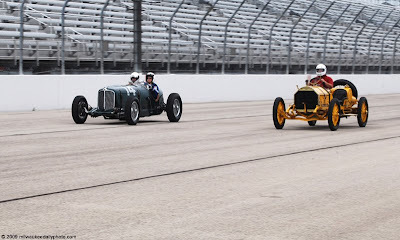 I went to the Milwaukee Mile today to check out this year's edition of the Miller Meet. Over 30 cars were in attendance, all made between 1910 and 1969. With such a variety, there were some interesting combinations as the cars made their way around the track. 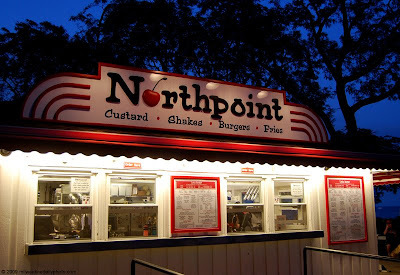 Tuesday evening, we stopped by the North Point Snack Bar and tried their custard. Thanks to the time and the cool weather, we had no problem getting to the front of the line to order. With a view of the lake and some tasty treats, does it get any better on a summer evening? Today was the first day of the Great Circus Parade Festival in Milwaukee. 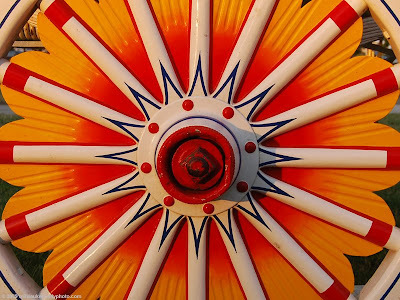 Many of the wagons for Sunday's parade are down at Veterans Park, as well as the Kelly Miller Circus, which performs through Saturday. I've never actually 'seen' the parade myself, but I did get a chance to ride on one of the wagons in the parade in 1985. Sometimes taking a good picture is just being in the right place at the right time. Tonight, we happened to be out cruising the lakefront, and stopped for some custard (more on that in a future post). 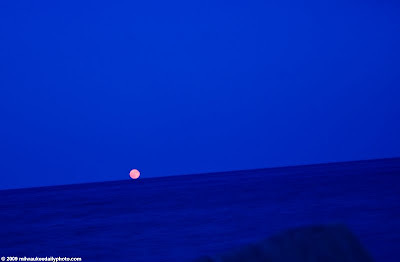 As we were getting ready to leave, we noticed a sliver of red peeking over the eastern horizon. I scrambled to get my camera setup and get a few shots off, getting this result. Today's photo is a shot of the Hoan Bridge where it crosses over the Maier Festival Grounds. 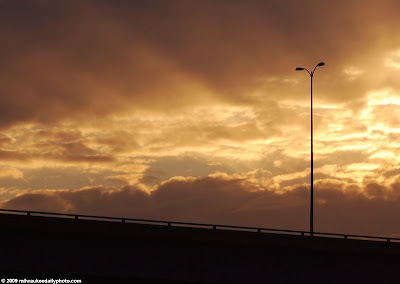 Looking west toward the sunset, all is in silhouette against the clouds. 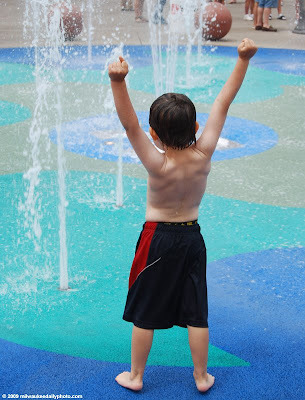 This little guy was having a great time on the splashpad at Summerfest yesterday. I'm not exactly sure what he was celebrating, but his posture certainly portrayed his enthusiasm. Our second day at Summerfest today, and we ended on a high note. 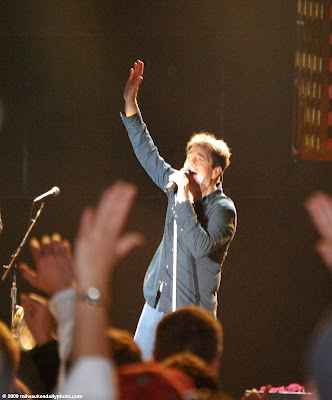 Huey Lewis (above) and The News played the M&I Classic Rock Stage. We were treated to an hour and a half of his hits, and it was certainly the best act we saw this weekend. 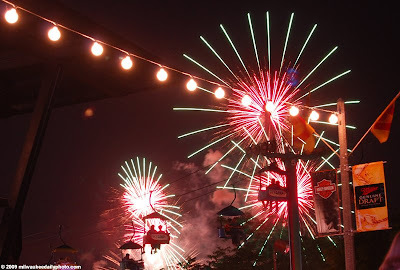 The 3rd of July means fireworks at the lakefront in Milwaukee. Today, I had the chance to photograph them from the Summerfest grounds, and this photo catches the riders on the Sky Glider in the foreground. Tonight we were at Mitchell International Airport to pick up some friends from Canada for the weekend. These "boats" are part of an installation called "Submerged Vessels". 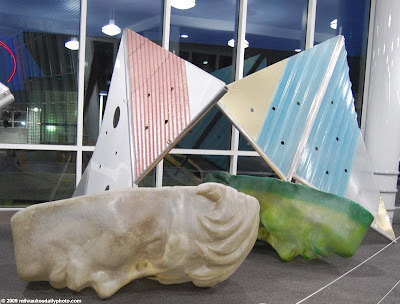 The giant faces appear to be made of fiberglass and look like boats with solid sails. 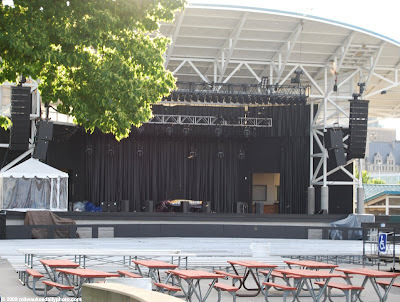 Today's photo is another from the Summerfest grounds. This empty stage is the Rock Stage, the northernmost stage at the festival. With its lake-facing position, and little between it and the lake, it's a great place to grab a table and enjoy the cool breeze on a hot day.